As a writer, I am always looking for a way to improve my process. Sometimes this includes being okay with writer’s block, and other times finding cool tools to help insert the occasional shortcut. In this case, the tools are the order of the day. Over the past few years I have tried several text expansion applications to see which application might be the best fit into my workflow. In this post, I am going to look at Phrase Express, a text expansion program for Windows – and soon Mac and iOS. The application has been around for quite some time (since 2002 to be exact) and I have used it on and off since version 8. Disclosure: I have been provided a license to PhraseExpress 12 and the beta edition of the app for iOS. Bartels Media has no input into the content of this review. PhraseExpress is an application that helps shorten the amount of typing that is done by a user. To do this, commonly typed items can be stored as phrases and shortcuts used to fill in this text. In addition, auto-text substitution for things like double letter correction, contractions, and auto-correct. While that is just the short version to give an idea of what the application is for, the rest of this post will go through just how things work. **A note about pricing:** Before we go too far, you should know that PhraseExpress is free to use. For commercial use, the application has a license. More information about Pricing is available here:In addition, there are a few versions of this application, a server version, a desktop version, and mobile versions. This post will focus on the desktop version of the application.ent here. **Why do I need a program like this? **If you have ever been working on documents or emails that are much the same, where a good portion of text is the same across these documents the typing can be tedious and copy/paste is even a bit tedious if there are enough of them. Then this might just be for you. Suppose that you are working on a blog post about a product and you find yourself typing the name of the company or the product constantly. I realize this is a post about a product, and yes that is why I considered this example first. PhraseExpress is a long word and typing something like #pe is much quicker. To make this happen, I open the PhraseExpress editor and add a new phrase called PhraseExpress, shown below in figure A. The name box in the dialog is the name of the phrase so you can organize your phrases.The phrase content area is the text or content that will be inserted when the phrase is executed. You can also set shortcut keys for things you really use a lot. Prefix and postfix can be thought of as a way to wake PhraseExpress up to substitute text and denote that the phrase is finished. In the image above, you will notice that there are many auto text items listed, each separated by the | character. This allows me to spell PhraseExpress incorrectly all over the place, usually from typing too fast.The last one “#pe” is the one I use to type a short string and get the auto text substitution. The prefix and postfix also help ensure that text entries used with phrases do not actually need to be used. Things like Ph# , which might be something used to denote the following is a phone number shouldn’t be swapped to enter a phone number. Instead #ph# could be used as a way to enter a phone number. This way you can show ph#: (555)123-1234 in an email signature or use it in a document by typing ph# #ph#. Using an application to help with text expansion will reduce repetitive text entry for sure, but how much time does it save you? PhraseExpress can tell you that too. In the main window, select the help pane and click the Statistics button. 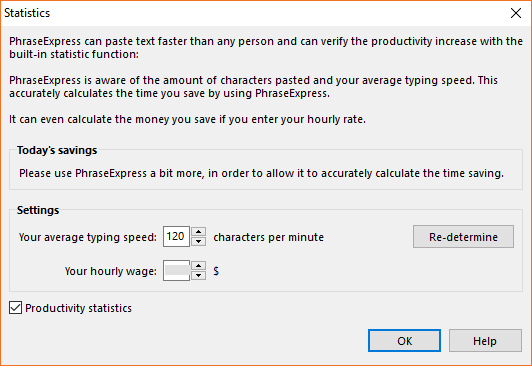 This brings up a dialog box that will tell you how much you can save by using PhraseExpress based on your typing speed and hourly wage. One thing to note, for PhraseExpress to accurately calculate your savings, you will need to use it quite a bit before calculating. When a new calculation is made you will also see a notification to let you know that the value has changed. **What other things can PhraseExpress do to save time? AutoCorrect – when commonly mistyped words are entered they can be corrected on the fly. While word handles this too, PhraseExpress can import the auto correct dictionary from Microsoft Word to avoid problems from each application trying to compete for attention. In the following sections I will go through a few examples of using macros in PhraseExpress to showcase how these shortcuts might help you improve your typing speed. Open the PhraseExpress editor and start a New Phrase by selecting the New Phrase object from the insert group on the ribbon. In the main window of the application, enter a name for the phrase. This should be descriptive so you can identify the phrase when it is listed in the navigation pane. In this case, the name of the company – Mrs. Gunderson’s Homemade Cookies would work. In the body of the phrase, the name that was entered is pre-populated, a nice touch I think. Note about Pre and Postfix: I have found the # key is a good delimiter for phrase substitution. Many things will not be wrapped in the # character in general use. There are two ways that come to mind to accomplish this. You can set the Pre and Postfix characters to Custom in the dropdown box, then type # in both dialog boxes. This will wrap the auto text in the # character. You can also leave the pre and post fix options set to None, Any, or Default and enter the delimiter right in the text box for the auto text. This is helpful if you want to see what the decimeter is when you look through your phrases. Try entering your shortcut in a program like Word or Notepad to test out the substitution. There are some phrases that I want only to use in a specific program.For example, I might have a phrase to insert Thank you for your email, at the top of an email message and specify only to use that phrase in Outlook. I do not use this often, but sometimes it is handy. In the main window of the application, enter a name for the phrase. This should be descriptive so you can identify the phrase when it is listed in the navigation pane. In this case, maybe E-mail to Speakers would work. “Good Evening – We are delighted to have you as a speaker for the upcoming conference on blogging and phrase expansion. I wanted to personally thank you for taking the time to present. I would make one small edit to the text if choosing to go this route, I would add a conditional macro for the word Evening that is based on the time of day. This way, if the current time on the computer is 9am, the macro would see that when the phrase was called and insert Good Morning and if the time on the computer is 2pm, the macro would insert Good Afternoon when the phrase was called. Remove Morning, Afternoon, or Evening for now and right click the white space. Then select Macro from the context menu and choose Programming.From the programming list select Check Text/Value to open the dialog shown in figureC below. In the text to check portion of the dialog, a macro was inserted to check the current time, formatted as 12-hour time (i.e. 9:00 PM). This was evaluated two times, once to see if it was less than or equal to 11:59 AM, in which case the word Morning was inserted and a second time to see if the text was greater than or equal to 6:00 PM in which case the word Evening was used. Following those checks, if none of them are true, so if it is 2:00 PM the default value of Afternoon will be used. The examples show off some of the horsepower of PhraseExpress and its ability to create complex or large replacements.Generally, when using this application, smaller things like spelling and text changing, where PhraseExpress really shines for me. There are blocks of text that sometimes become repetitive, a book I was working on not too long ago, had to incorporate the idea of tap or click for mouse actions because the content was also suited for touch screen devices. Rather than try to work through the entirety of the content with Find and Replace, I created a shortcut with a prompt to ask me if I meant Tap or Click when I entered click. I still have this phrase in my collection today, as you can see… when I enter the word “click”, shown below in figure x, a popup box appears to ask if I need the phrase or not. One last thing to discuss is sorting and/or keeping track of phrases. PhraseExpress has a few interesting ways to manage that as well. First, I have found that the three pane view is perfect for seeing both the name of the phrase and its shortcut when looking through the file. It is rather hard to remember all of the shortcuts for replacement that get created. While they are helpful, I cannot count the number of times I have just typed the text because I hadn’t used PhraseExpress in a while and forgot I had a phrase or simply couldn’t recall the shortcut. Think of this as a cheat sheet for phrases. I think I might try printing the list – with the ever growing collection of shortcuts that I’ve been collecting, it may help. This post does not cover every feature of PhraseExpress and may not have found the feature that works best for you. Download the free version of the application from here and give it a try. It may be a great addition to your toolbox. **PhraseExpress is also available on Android today and coming soon to iOS and Mac OS. I have used the beta of the iOS application and it is very handy. Since PhraseExpress allows cloud storage of phrase files, specifically iCloud for use with iOS, the Windows application can be used to create phrases to use on my phone. I can create phrases on iOS, but for some bigger phrases (those with Macros) Windows needs to be used. **Where would I use this on my phone? **Generally, using this when texting is handy. Using shortcuts much like auto text when texting or doing other things on a smartphone is great. Remember, the smaller keyboard still takes work to use and getting bogged down in long text messages is no fun. One example, I have used a shortcut to provide a text containing directions to common places around my city – just easier that way. In addition, the PhraseExpress keyboard on the iPhone allows me to popup the list of phrases and tap one to insert it – again helping with remembering phrases and their shortcuts. I am interested in looking at the Mac application to see how it compares to the Windows version. There is a feature of PhraseExpress that is needed to make easy cross platform and mobile usages work – cloud storage. PhraseExpress is smart enough to realize that it’s phrase file(s) are located in a cloud synchronized folder. For example, if I put phrases.pxp in a folder that syncs with OneDrive, the application will recognize that and the phrase file icon will change to a cloud. For synchronization with iOS, the phrase file must be synced with iCloud. This allows your file to be edited on a Windows machine (Mac coming soon) and shared easily with an iPhone. For other cloud synced phrase files, any Windows computer that can access that file on OneDrive (or Dropbox) can share that cloud file for phrases. This reduces the amount of file transferring needed to share phrases between two separate systems and should reduce the number of duplicate phrases kept. I know I didn’t go into a lot of detail about cloud based phrase files, but the best part is that PhraseExpress just handles them and they work as would be expected. **PhraseExpress is supported primarily through email, although paid services are available and the support is top notch. Usually responses are received within 24 hours and while there may be an occasional wait for assistance, rarely does support take long to receive. I also want to thank the team at PhraseExpress for their patience and speedy responses when questions popped up or a feature wasn’t working. The support received for the questions I have had over the years of using this application has been second to none. Since most of the time people, myself included, only need support when things are going wrong, I wanted to specifically call out the great support I’ve received from the PhraseExpress team. **PhraseExpress is a great application for removing the tedium from some of the typing that computer professionals or any others who use a computer a lot. It is a very handy application and has been a great tool for me.I have used other tools to accomplish these things, but PhraseExpress has been what seems to be the best fit for me. When the iOS and Mac applications land I am very interested in seeing how they compare to Windows. Do your self a service and give PhraseExpress a try, it might just save you more time than you thought.